Next weekend will be bursting with song, courtesy of two area choral groups offering two very different, yet equally enjoyable, programs. In the first, the Delaware Valley Chorale (photo at left) performs Roy Ringwald's God's Trombone's in two venues in Newark and Wilmington. Based on the poetry of James Weldon Johnson, this powerful spiritual piece is often performed by African-American choruses. DVC condcutor David Christopher wanted to challenge the ensemble this season with more ambitious choices of repertoire. The performances will feature guest conductor C. Lawler Rogers, narrators Tina Betz and Joshua Martin, and soloists Angelyn Robinson, soprano, David Anderson, tenor and Jeffrey Chapman, baritone. Additional pieces will be Mass in G by Franz Schubert and On Green Mountains by Steve Danyew. Saturday, November 21, 2009, 7:30 p.m.
Tickets: $20; $16 seniors (60+) & students; $8 children under 12. To order, call 302.325. 4110 or see http://www.delawarevalleychorale.org/. The next choral program is from CoroAllegro (photo at right), led by Jack Warren Burnam. The program, entitled A Musical Banquet, is a whimsical repertoire meant to entertain audiences with a celebration of pleasures of food, drink and merriment. The repertoire includes the music of Felix Mendelssohn, Bob Chilcott and others. Chilcott's piece, Fragments from his dish, displays moving and humorous lyrics in a food theme. Another piece, Play with Your Food! by composer Paul Carey, serves up a satisfying yet unusual love story that might surprise you! 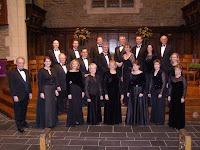 Saturday, November 21, 2009, 8:00 p.m.
To order, call 302.652.3997 or visit http://www.coroallegro.com/. Hope folks enjoy the CoroAllegro concert- wish I could be there! Your piece was our finale, and it was quite a hit! Amidst the gourmet spread of our reception food, there was a plate of peanut butter crackers, as well as some "beans of jelly." To Delaware Arts Info: thanks for the plug!